Sommerferienkurse - paper your world! 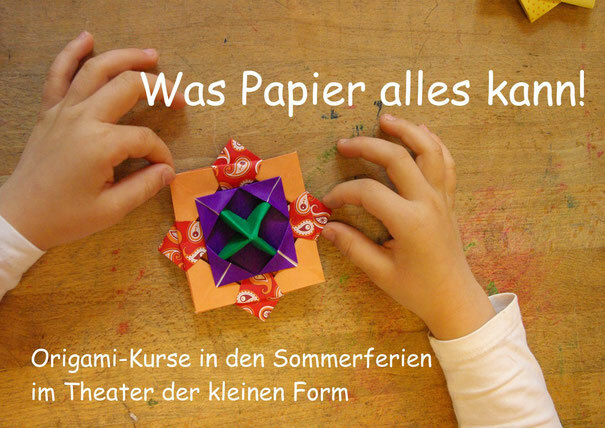 In den Sommerferien biete ich zwei Origami-Kurse an. Der Kurs findet in den Räumen des Theaters der kleinen Form statt, in der Gubener Straße 45 Berlin, Nähe S-Bahnhof Warschauer Straße. Der Kurs ist für Kinder der 2.-4. Klasse, die keine oder wenig Vorerfahrung haben. Der Kurs kostet pro Tag 13 Euro. Ein Kurs kommt ab 5 Kindern zustande. Hurrah! At last I got a blog from where I know how to really take useful information regarding my study and knowledge. I've been exploring for a bit for any high quality articles or weblog posts on this sort of area . Exploring in Yahoo I ultimately stumbled upon this web site. Reading this info So i'm satisfied to exhibit that I have a very just right uncanny feeling I discovered exactly what I needed. I such a lot for sure will make certain to do not put out of your mind this web site and provides it a look regularly. For newest information you have to pay a visit web and on internet I found this website as a best web site for most up-to-date updates. Hey there! I simply want to offer you a huge thumbs up for the great info you've got right here on this post. I will be coming back to your web site for more soon.